Let’s start with the last of the three, the collision on Aug. 29 on River Road that killed Mingo Pelkey, who was on her bike when she was hit from behind by car. I met a woman — we’ll call her E. — who had gone to Don Juan’s Mexican restaurant that night about 7 p.m. Don Juan’s is on River Road, on the west side of the street a couple of hundred feet south of the intersection with Irving. 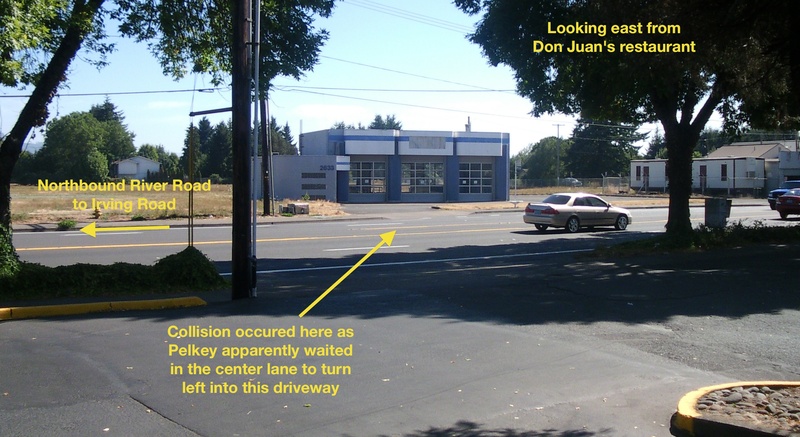 There’s a Shell station on the southwest corner of that intersection, and Don Juan’s is in the next building to the south. The dining room has a window that allows patrons to look out to River Road. E. had been seated in the restaurant and was waiting for a friend to arrive. She could not see out the window herself, but was facing a party at another table that was in front of the window. A woman at that table suddenly shouted “No!” and then stood up and screamed. People ran outside. It was chaotic. E. said she could see Mingo Pelkey lying motionless in the street. Cars were stopped all over the road. The car that had hit Pelkey, a silver VW Passat, did not stop at the site of the accident. It continued north another 100 yards or so, through the light at Irving, before pulling over in front of the DariMart on the northeast corner of River and Irving. The windshield of the Passat was “gone,” E. said, apparently shattered out by the collision. Near the site of the collision. E. said she talked to the woman who had been looking out the window as the wreck happened. As it comes to me — so this is second hand, but I have no information that disputes this — Pelkey was stopped in the center turn lane. She appeared to be waiting for southbound traffic to clear so she could turn left into a driveway adjacent to the south side of Don Juan’s. She was signaling a left turn. The witness told E. that she saw the Passat coming north, going fast, in the right-hand lane. It made an erratic move, perhaps trying to pass another car and swerved to the left. The woman told E. she thought to herself: that car is going to hit the cyclist. And then it did. Pelkey and her bike were thrown down the street. 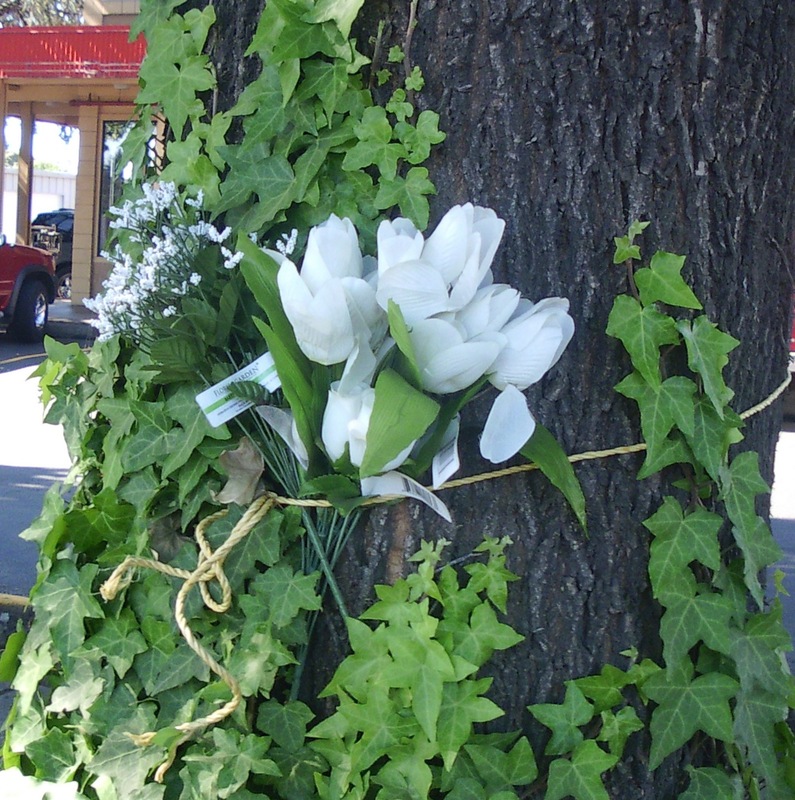 Going back to July 9, seven weeks prior to Pelkey’s death, Gleich was in another accident on MLK Boulevard in Eugene. It was about 3 p.m. on a Saturday. He had been at his office and was going home. He crossed the Ferry Street Bridge, exited onto MLK Boulevard and pulled up to a red light at Club Road. Immediately in front of him at the light was a red Nissan Z. The light turned green and the red car “spins his tires,” T. said. “He burns a little rubber.” Up ahead, a black BMW was pulling out of the driveway of the BMW dealership, crossing the lanes in front of the red Z, in order to turn left onto MLK heading the other direction, toward Coburg Road. When the driver of the BMW saw Gleich coming, he stopped in the lane in front of Gleich because it looked as if Gleich, still accelerating, was going to swerve to the left and go around the front of the BMW, a passenger in the BMW told me. T. said the Z then stopped accelerating for a second. Then he re-accelerated and tried to swerve to the right to go around the back of BMW, but he crunched the back end of the driver’s side. If T.’s recollection is correct, the account of this wreck in the police report is inaccurate. The officer (B. Mainard) writes that Gleich told him he had merged onto MLK from Club Road. To do that, you don’t have to pull up to regular intersection and make a regular right turn. The right lane on Club makes a sweeping curve into MLK, allowing a car to keep some of its speed as it merges onto MLK — like a freeway interchange sort of thing. Gleich told police he rounded the curve, merged into the left lane traveling about 35 mph (the speed limit on MLK). He told the officer he saw the BMW and was unable to avoid it. But T. says he is certain the Z was on MLK the whole time and was stopped right in front of him at the light. If T. is correct, why would Gleich tell the officer he came from Club Road? Well, it seems to me it would be harder to have that collision 200 feet after being at a dead stop than it would be if you were already traveling 35 mph coming around a bend. The passenger in the BMW, the driver’s wife, said the Z seemed to be accelerating right into the collision. “He slammed into us so hard if had been any other car we were in we probably would’ve been very seriously injured — or if he had hit just slightly in front of where he did, my husband (who was driving) would have been toast,” she told me. There are other discrepancies between the witness accounts and what the police report says. When the BMW driver’s wife saw the report and felt it was not accurate, she called Officer Mainard and his sergeant several times to try to get things corrected and explain what was wrong, but she says she was never able to speak to anyone about it. She called the police investigation of the accident “pathetic” and “incompetent.” Sure, she has a vested interest, but she is clearly frustrated — and now that another Gleich wreck has had fatal consequences, she is very upset and angry. T. says he has been contacted by neither the police, nor the district attorney (as of Friday), although he said he had been contacted by Gleich’s attorney. T. said he told that attorney the same thing he told me. Going back about 3-1/2 more weeks to June 13: Gleich, driving the red Z, collided with a pickup truck at Pioneer Parkway and Q Street. I did talk to the driver of the pickup, a contractor who had no kind words for Gleich. I also talked to a third party who was in another vehicle and saw the collision. Gleich was cited for running a red light in that accident and colliding with the truck as it went through the intersection. Gleich is contesting the ticket and is supposed to be in Springfield Municipal Court on Tuesday (Sept. 27). The third party, a retired Springfield police officer, said he had been subpoenaed to appear in court to testify. Because of that, he said he didn’t want to speak with me about what he saw until after he testifies. The contractor said he spoke with the retired officer right after the accident and asked him, “Did I go through a red light?” He said the retired officer said no. The contractor had recalled seeing news reports about Pelkey’s death. But until I explained to him why I was calling, he said he had no idea that it was the same motorist who was involved in his accident. I have asked the police and the D.A. whether Gleich is still licensed to drive. They won’t say. I called the DMV only to learn that whether someone is legally licensed to drive is not a matter of public record. So they wouldn’t tell me either. From what I’m able to gather, since Gleich has not been charged or convicted of anything at this time, there is probably no way he could be suspended. So it would seem he probably is still licensed. We can hope he has been advised to stay off the road or is doing so voluntarily. We can hope. *Please* write this up for the Reg. Just how far do you leave the scene of an accident (100 yards) before it is hit and run. I would think that the idea was to get out of your car and assist the person you just hit? Keep up the good work. You’re doing more real journalism here than the majority of the pros in this town. I fear that nobody in power has such a complete picture…and you must be right, if they haven’t charged him, he probably still has a license. Thanks so much for reporting on this injustice. I wonder if the court is open to have the public witness this case tomorrow? It should be a regular open public courtroom as far as I know — at Springfield Municipal Court, 230 Fourth St. I was hoping to go, but I am not sure my schedule is going to work out. Would be great if others could find the time. It’s supposed to be at 8:30 a.m. 9/27. Couldn’t hurt to call Springfield Municipal Court (541-726-3748) just to make sure it’s still on schedule. Are you moderating the comments? If so, I’d like to pass some info on to you. If not, I’ll find some other way to get it to you. At the Tuesday hearing, Gleich was found guilty on the red light citation. I wasn’t able to be there, so I don’t have a lot of details. I have a request in to get the paperwork. The next step I think might be just to wait for the investigation to finish up in Mingo’s collision. I was looking back to some other cases not unlike this one — in a case last year, the investigation took about 2 months. So it could still be a little while before we hear anything on that. I do suspect the police and D.A. are being thorough and careful. Thanks. I know you’re right on the investigation into Mingo’s case. It’ll take time. Thank you for bringing attention to this event. I suspect this guy will have criminal charges brought up against him. How could he have kept driving when his windshield was shattered from the crash? Seems to me the bike or cyclist or both had to have hit the windshield to cause it to shatter and he did not see this???? I will keep up on this case and I am hoping the DA will do the right thing and bring charges against this guy who should have his license suspended indefinitely. he rambled on about Paul McCartney then called her a loser! (she is not and has a great family, job and has never even gotten a ticket!) Who’s the loser now? ….and criminal charges brought against him also. orducksgo, I predict something less than a six-month sentence. Striking (maiming, killing) a cyclist with a car is not seen as a serious matter by most motorists (i.e., most people). After all, as we know from people as diverse as Oregon State troopers to the clueless observers of Crow, cyclists just should not be on the roadways, interfering with impetuous scofflaws in their multi-ton vehicles. Thank you for your personal investigation into the tragic death of my life long friend, my wife’s best friend. Thank you. PjC. Reading the comments here is a scary thing. Lynch mob mentality. Hopefully the facts will be clearly presented from both perspectives in the trial. There is far more hyperbole than facts reported so far on these comment sections. It’s awful when someone loses their life in the normal course of their day. It’s awful when you’re in an accident that ends someones life, regardless of responsibilty. It’s awful when anyone on the side of cyclists condems a motorist without a full knowledge of the facts or visa versa. Could be no one’s “fault” just like when you accidently do anything. Could be downright malicious. Who knows? That;s why there’s a trial, to determine whether the actions and events meet criteria to be crimminal or not. When something happens accidentally, it doesn’t mean that it’s no one’s fault. Now that he has been charged, we at least get a sense of what prosecutors are thinking they might prove: If it was “malicious” it might rise to the level of murder. But he was charged with Manslaughter in the first degree under ORS 163.118(1)(a) and Criminally Negligent Homicide. Without getting into all the legal definitions of “reckless” and “negligent” we can simply say it is surely harder to prove the former. They charged him with both, as I understand it, so that in case a jury decided they didn’t prove the former, the jury would then have to consider whether they proved the latter.